These days the original Civilization is an astoundingly clunky experience. It’s not actively painful to play, but there are a lot of ancient mechanics that make me wish I was playing one of the newer iterations in the series. Settler units being responsible for terrain improvements. Food and shield upkeep for military units. The horrible, horrible combat system that cannot be trusted. Mechanically speaking it was showing its age ten years ago, and today it is quite literally a museum piece that’s almost only worth playing as a historical curio. Despite this, though, I do keep revisiting Civilization once every couple of years, and it’s entirely down to one thing: the city view. 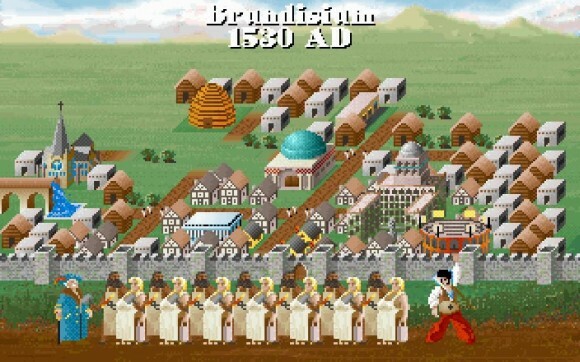 Look at a typical gameplay screen from Civilization. 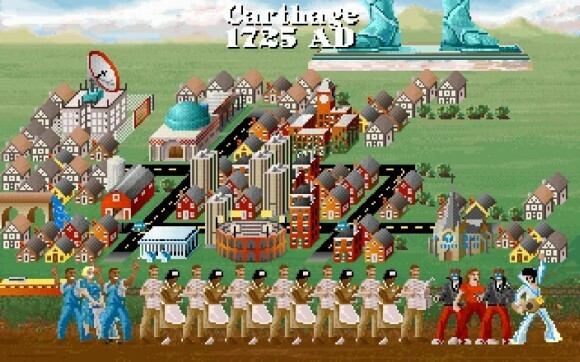 The visuals are fairly basic, even for a game from 1991; there’s very little time devoted to artistic flourishes aside from some animated waves sloshing around the coastlines, and otherwise every single visual detail is there because it communicates some kind of mechanical information – tile types, resources, improvements and so on. It’s the same problem facing Civ V’s city screens, albeit one imposed by the technology of the time and the limited resources of a small development team rather than bad design. However, there’s a big difference in the approach each game takes to its rather stark portrayal of game information. Civ V prefers to ignore the problem of its lifeless cities, and hopes you’ll be able to draw some sense of atmosphere from the world map and the emergent narrative at the core of every Civilization game. The original Civilization on the other hand – which, let us remember, was made nineteen years earlier — attempts to tackle it head-on. A city in Civilization is represented by this horrible square graphic which is designed to pack in the city’s vital statistics and nothing else. Click on the city and you get the familiar lists of numbers, albeit presented in a visual style that I happen to think is actually more effective than that used in Civilization V (I especially like coins and bulbs being represented as actual stacks of coins and bulbs rather than a coin or a beaker with a number next to it). 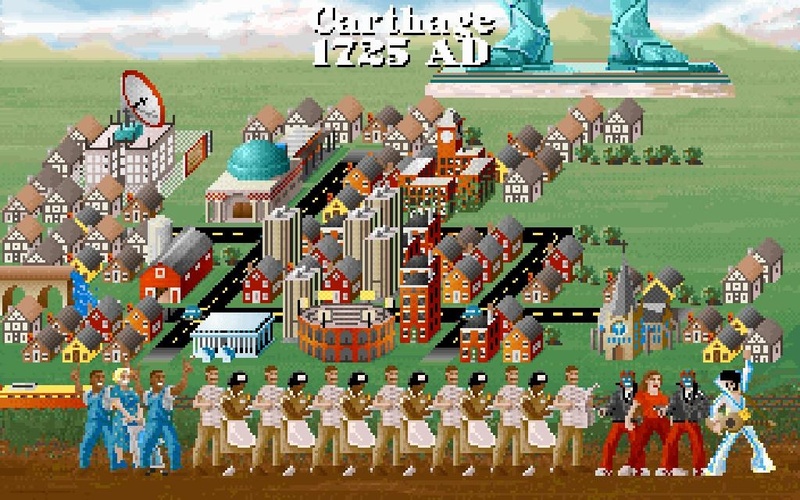 There’s also a little line of figures along the top of the screen that represents your assorted citizenry, and if this were all Civilization bothered to do I think it’d already be taking a superior approach to injecting some life into the city screen through actually portraying your citizens as people rather than an abstract number or a little coloured circle. Civilization doesn’t stop there, though. On the city screen interface is this button marked “View” which, when clicked, takes you to this wonderful panoramic cartoon view of your city. 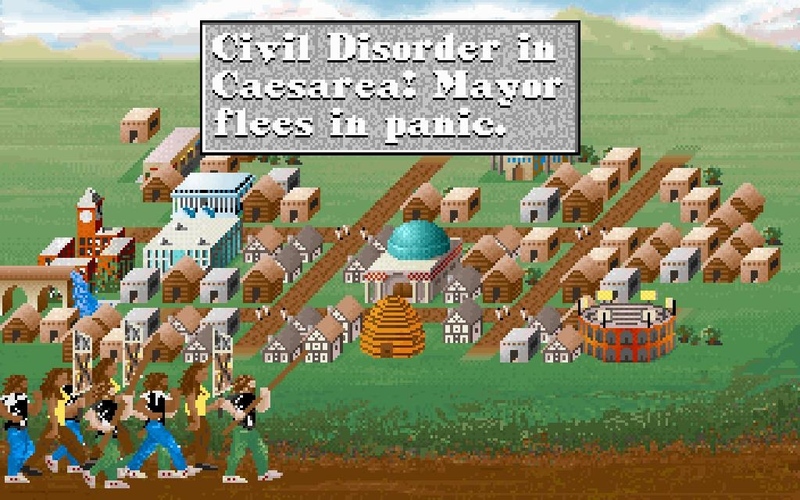 It must have taken ages to implement since it contains what are by far the most detailed graphics and animations in the game, and to their credit the Microprose development team made very effective use of it since it’s not just a static representation of the city in question. When you found a city with a settler unit you get a cutscene where the settlers drive up to the city site in their wagons and build some huts. While all the buildings you have built are represented somewhere in the city and can be viewed at any time, when you build them you’re treated to a little scene where it materialises in place which gives you a feeling of having accomplished more than adding 10% to the city’s gold output. Building a wonder is even better, since these are ridiculously huge structures that really stand out in the bijou depiction of the city view (the Colossus in particular is great, since all you can see are the statue’s feet). When the citizens of a particular city are unhappy they’ll march through the streets with pitchforks and torches or – later on – placards and signs. When you invade an opponent’s city you get to see an animation of your military forces doing the same, which is a nice excuse to show you what it is you just managed to capture. So the city view isn’t just a more detailed picture of your city (this is where Civs 2 and 3 went horribly, horribly wrong), but is also used in as many situations as the developers can think of to add a sense of place to the game that’s sorely lacking from what you spend most of your time looking at in the world map. 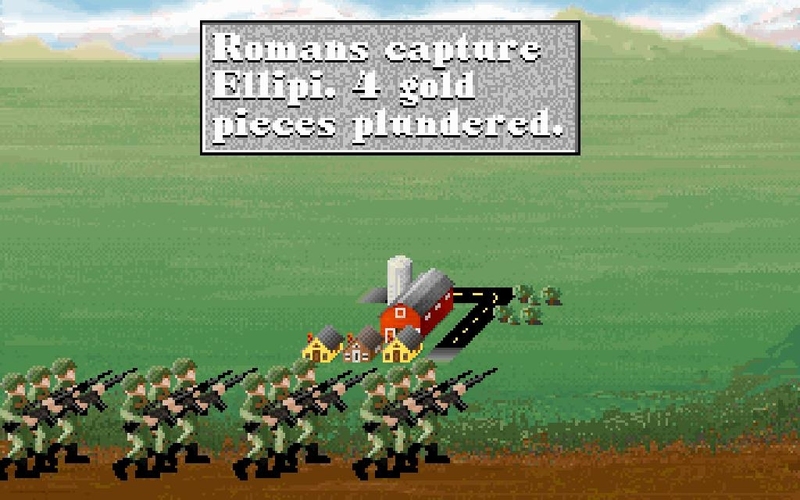 The view even updates from time to time as you advance technologically, with the wooden huts and dirt roads being replaced by skyscrapers and tarmac and your soldiers progressing from legionaries to musketeers to modern infantry. Even the bog-standard citizens stood out front will update, and there’s unique graphics for nobles, entertainers, tax collectors and scientists. 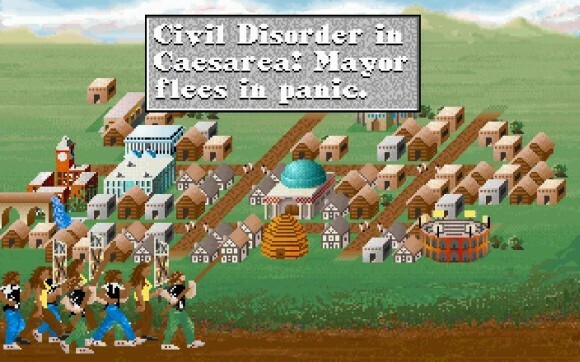 The game does this in a few other places too, with the terrifying Sid Meier-analogue philosopher eventually being replaced by a scientist wearing a lab coat, and your advisors changing their appearance with time as well as with successive government types, but it’s in the city screen that this change is most striking. This one seemingly-cosmetic feature does much to imbue Civilization’s cities with a sense of liveliness that’s missing from the sequels1. Civ V’s cities will visibly grow on the world map and the odd world wonder will show up outside them when you start construction, but otherwise one city looks much like another. Managing to build a wonder on the higher difficulty levels is a rare event, and so the game can’t rely on them to mark a city out as a distinct place. It has to do it through the features all cities have access to – their population and their improvements – and this is something that Civ V fails at in a rather abject manner, since both are barely represented on the world map. From a game development perspective I can understand why this is so. Art assets are very expensive to produce, and coding non-interactive elements just to fulfil a sense of atmosphere is rightly seen as something of a lesser priority than, say, getting the AI to behave in a rational and sane manner.2 What Civilization does with its city view is also a big no-no in modern game design; jerking the player away from what they’re doing and shoving them into what amounts to a cutscene at the end of every turn is something that I probably wouldn’t look too kindly on if I saw it in a modern game.3 Still, I can’t help but think that Civilization regresses slightly with each new iteration; lessons learned during the design and development of the previous games are jettisoned, ignored, or simply not implemented due to lack of time and resources, and so each time I buy a new Civ game I’m struck by what is conspicuously missing rather than the brand new features the dev team spent hours laboriously coding. I accept that Civilization does have to iterate and come up with new design elements, and that Firaxis can’t just make the same game over and over again with prettier graphics, but I would have thought that atmospheric touches like the city view and the cultural unit appearances seen in Civ 4’s expansion packs would be universal across the entire series. A new game built on new technology is an opportunity to implement more of these; it is not an excuse to toss out old ones. That’s something I think the designers at Firaxis would do well to remember as their recent games (including XCOM) have been particularly afflicted by this peculiar brand of amnesia, and it’s made them substantially less than they would have been had they kept their past firmly in mind. Agreed. I have been playing a fair amount of Civ lately (procrastinating from uni work!) and the city screens are something I keep going into and thinking “there must be more interesting stuff I can do or look at here” but there just isn’t. It really feels like something is missing. Even shuffling specialists and workers around is ultimately window dressing. It’s remarkably non-interactive. I can’t help it if we have diametrically opposite opinions on what Civ should be. Did anyone play Fallen Enchantress? 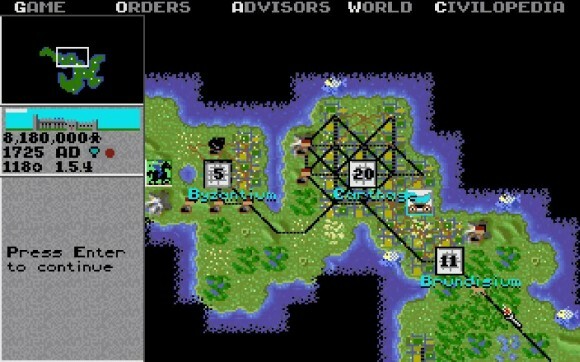 Because several of the features Shafer mentions–specifically diplomacy and resources–are identical to what FE uses. I agree with him about the resources, but a big part of why it works in FE is that you have many ways to work around it. I’m not so sure about the diplomacy, though. In FE, it’s remarkably easy to keep on the good side of other factions thanks to the cut-and-dry nature of how it works, and unless you are an especially aggressive player (I’m not) it tends to be kind of boring. Elemental looked interesting while it was in development, but the subsequent car-crash of the launch and general skeeviness at Stardock put me off it and any future games they make. Anyway they’re making Age of Wonders 3 now, so I can get my Master of Magic fix elsewhere soon. Civ I was the best. It’s ageing, but at the time it completely redefined my idea of what a game could be. Happy memories! And I’m with you on the whole beehive thing. I didn’t realize Civ I had something like this. I always loved the city screen in MOO2 and wish more games would take the time to do this kind of stuff. And not to derail the comments, but that Jon Shafer thing is fascinating. However, I can’t help but wish he’d have paid more attention to the extremely good work Firaxis have done with fixing Civ V rather than declare virtually everything he had originally envisioned a failure. For example, the AI in Civ V is now much more like what he describes (Ramses in particular seems to have a very specific strategy, and I find him to be a nightmare overlord because of it). His praise for Civ IV–like everyone else’s–also conveniently forgets all of the bloat and false choices that game had. Espionage, corporations, and random events were all terrible, religion was hollow, and many policies weren’t really worth using (slavery being a prominent one; morality aside, don’t offer something that isn’t worth using). Furthermore, I remember health being 100% as fiddly as happiness. Oh, except Civ IV also had happiness ON TOP of health, except on a city-by-city basis. I always, ALWAYS took environmentalism just to deal with it by the endgame. I guess it all goes back to what you said about not learning anything from previous games. The good and the bad are often forgotten, and what we end up with is either oblivious divergence or oblivious devotion. It’s also one of my favourite hidden-ish features in Rome; it’s nice to be able to go into your capital in peace time and admire the huge temples, etc, even if it is just the battle map plus a bunch of mindless NPCs wandering around. Yes to everything you say here. It’s like, he understands that Civ V was a bit broken at launch, but has decided that the only way to fix it is to undo everything and pretend it never happened. I loved Civ IV but I agree that to just go back to the way things worked there would be a poor regression. Firaxis have done a great job patching up Civ V so that it more-or-less functions okay, and there’s now a solid base to build on for a sequel. Some of the design changes were fundamentally bad (like hidden diplomacy factors) but they were easily fixed, and I honestly think that stuff like one unit per tile works quite well in its current state. The solution certainly isn’t to throw it all out or change things wholesale just because you can. I was expecting Shafer to make a slightly more robust defence of his design decisions than he did. Repudiating basically the entire game as a mistake with the benefit of hindsight doesn’t do a great deal to inspire faith in his future design decisions; what if in three years he ends up writing a similar screed about At The Gates? As you say, Firaxis demonstrated that his basic design decisions were essentially workable, and his lack of faith in his own design – and, more importantly, his unwillingness to stick with a mechanic that isn’t quite working properly, fine-tuning and iterating – is worrying. I agree that this is something missing from Civ IV – building cool stuff just isn’t as satisfying as it should be if you can’t see your city develop. Are you saying that the expansions improve this, and if so, which one(s)? One of the expansions for Civ IV (probably Beyond the Sword) adds a few culture-specific looks for certain units like axemen and spearmen — German spearmen will have wooden shields and dull armour, while Greek spearmen are proper hoplites. It also (I think) added culture specific tile improvement appearances, so you could cover the land in Chinese pagodas. It was great for marking out civilizations as being broadly different past the specific differences of unique units and buildings, and it’s more atmospheric going to war with a civ that has an obviously different appearance rather than fielding identical riflemen who are blue instead of red. It’s not a major game feature or anything, but it did matter. I will never understand the human race’s innate desire to rank things in lists. I mean, god, each of them does certain things very very well and stands on its own merits. You could make a case for liking any of them best.